Original Sole is an Australian owned company specialising in unique & innovative shoe accessories. The passion for shoes and developed products make it even more enjoyable to wear them! There are currently 2 main products Shoe Sole Grips & Heel Huggers, with other exciting products to be released soon. The Shoe Grips were developed to help women to be able to walk with confidence in their shoes. Make no mistake about it, whether they are completely flat shoes, wedges, boots or 5 inch stilettos, the base of most shoes soles are made with little or no grip, and most of us have embarrassing slipping stories to tell! Applying a Shoe Sole Grip helps to prevent these moments from happening. 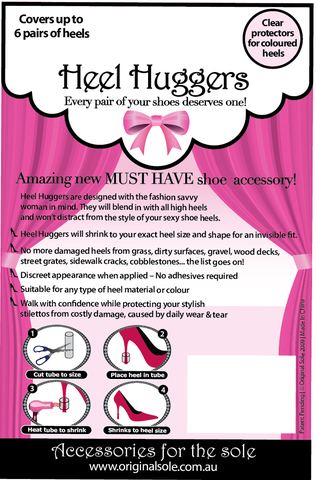 Heel Huggers are the other fabulous product from Original Sole. They are a unique, brand new product world wide (patent pending). Managing Director & shoe lover Vanessa Moskos, wanted to find solutions to help prevent ruining beautiful heels. « Giuseppe Zanotti – White, the summer must have !